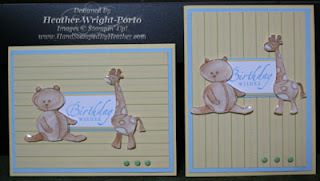 These adorable baby boy birthday cards are part of my Birthday Card Kit class. They use the same cardstock and accessories, one is just a vertical layout and the other landscape. Substitute the blue to pink for a girl or purple or green. Designer Series Paper from a retired baby boy Simply Scrappin' Kit. Stamp the bear and giraffe in Chocolate Chip ink and then use a blender pen to color with Creamy Caramel or Close to Cocoa. Then cut them out. Then place on a piece of scrap paper and cover it with Crystal Effects. Set aside to dry for quite some time. I normally do this at the start of a workshop and it is dry and ready to assemble by the end of the workshop (just to be sure it is completely dry). Adhere layers of card stock. Pierce 3 brads in lower right corner and then adhere those layers to card front. 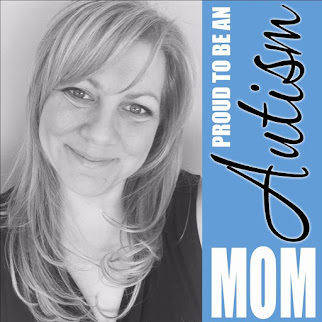 Stamp greeting in Blissful Blue and layer greeting. Adhere greeting to card front. Adhere animals to card front with Dimensionals.